Autor de la imagen: Awesome Reaper Artwork, creo, al intentar acceder a pinterest me sale que debo registrarme. A la hora de buscar miniaturas de la muerte o simplemente No-muertos a esa escala, ninguna se acerca a la fuerza y el carácter que demuestra la imagen. Hueso, tela, madera, metal, plumas y cuero, con varias opciones a la hora de plantear iluminaciones. Puede que se encuentre algo limitante las gamas de colores a usar, aunque por lo general en figuras tan oscuras se trabajan más los contrastes que la profusión de colores. Acabar las alas que no aparecen en la imagen, y posiblemente cambiar parte del peto superior para hacerlo más «estándar», aunque ésto último sería sólo preferencia personal. Cuando se ven otras figuras de temática parecida, siempre es la misma idea. El incluir las alas y la armadura, así como el aspecto general de la figura hará que los que no compran figuras similares por el concepto tan repetitivo quieran pintarla. Además en general parece que se sale de la zona de confort de las miniaturas normales, planteando un buen reto al comprador. Author of the image: Awesome Reaper Artwork, I think. Scale: 75mm, I think that on that scale could have fun time painting all the details in an appropriate looking. Name of the figure: The name would be chosen from all subscribers that chooses it. 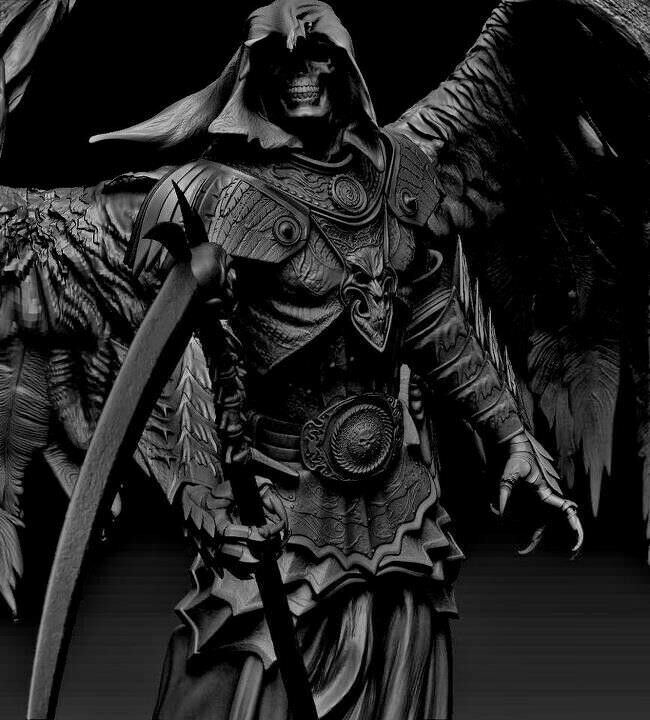 When you look for miniatures of death or simply Undead on that scale, none comes close to the strength and character that the image demonstrates. Bone, fabric, wood, metal, feathers and leather, with several options when it comes to lighting. You may find something limiting the color palettes to use, although usually in figures with that dark works better the contrasts than the profusion of colors. Finish the wings that do not appear in the image, and possibly change part of the upper breastplate to make it more «standard», although this last would be only personal preference. When you see other figures of similar theme, it is always the same idea. The inclusion of wings and armor, as well as the general appearance of the figure will make those who do not buy similar figures by the concept so repetitive want to paint it. In general, it seems that it leaves the comfort zone of normal miniatures, getting a good challenge to the buyer.